A lot of developers across the slots market are pushing the boundaries of slots in order to adopt a more innovative and unique approach to slots gaming. There was a time when a slot was defined by its features but now it seems slots are also being defined by their general layout. You only need to look at the arcade game-inspired slot Max Damage and the Alien Attack by Microgaming to see how developers are looking beyond slots for their ideas. 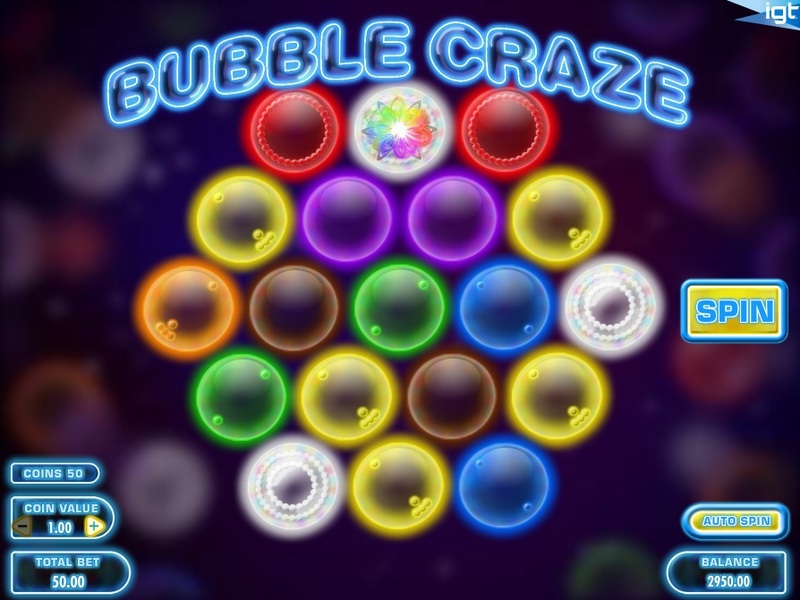 Bubble Craze by IGT is a new member of this new breed of arcade-styled slots. The first thing you will notice with this slot is that it does not have the layout of your stereotypical video slot. There are reels in the sense that symbols are positioned next to each other in an order but they are not your archetypal reels that are positioned in columns and rows... which is strange. Is this the future of slots gaming? Am I too old for this new slots generation? Am I too traditionalist? Instead of the symbols falling down or spinning into position, the symbols rise from the bottom of the screen and land in their position on the screen. The layout gives it a similar feel to IGT's own release of Bejeweled in the way that it pushes the envelope when it comes to categorising itself as a slot. However, essentially, this is still a slot. You must try to align symbols into position to complete winning combinations and earn payouts. The symbols that you must try to align consist of different coloured bubbles. In a cool little feature, after every “spin” is complete, the bubbles will all burst and a new set of bubbles rise from the bottom of the screen. The bubbles come in the colours of red, orange, yellow, brown, green, blue, and purple. You will earn at least 10x your stake if you can group four or more of the same colour together. There is more to this slot than just matching coloured bubbles. You must also keep an eye out for a number of the special symbols on offer. The multiplier bubbles can appear on each “spin” and these will add the specified multiplier, up to 5x your stake, for the colour of bubble they represent if you hit a winning combination involving that coloured bubble. You also have the free spins bubbles. These are bubbles with a multi-coloured centre that appear and offer you 5 free spins if you hit three or more of them on any single spin. Every free spin will deliver a winning combination with more multiplier bubbles added for each free spin. There is one more symbol left to cover and that is the transform bubble. This is a bubble that has four arrows located at its centre and this bubble will turn every bubble positioned next to it into the same symbol as itself to create potentially huge winning combinations. It is possible to trigger up to a 10,000x your stake win with the transform bubble. 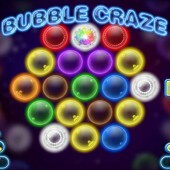 Bubble Craze is a fascinating slot. I was sceptical when I started playing it but I've seen how it plays and I have to admit I do think it is a fantastic addition to the IGT slots portfolio. IGT has still managed to fit in a free spins bonus round and even though there are no other bonus features, the inclusion of the multiplier and transform bubbles ensures that there is the potential for chaotic action on every spin.